These folks make the SunCommon trains run, mastering all of the back office functions that allow the solar professionals to do their jobs so Vermonters can go solar. Chach is responsible for finance, accounting and planning at SunCommon. He joined the SunCommon team in 2015 to help execute the company’s vision to make it easy and affordable for all Vermonters to go solar. Chach grew up in New England and received his BA and MBA from Dartmouth College, with six years of investment banking in between. 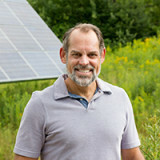 He has spent the last 22 years as an entrepreneur managing high-growth companies in Vermont, and has 15 years experience in renewable energy, most recently as CFO of Northern Power Systems and CEO of Draker, Inc.
Chach, who enjoys life in his solar-powered home, loves all forms of human-powered outdoor travel, and frequently commutes to work on his bike. He lives in Waitsfield with his wife Kari and younger daughter; his oldest daughter is off in college.